Basil downy mildew is caused by the fungus-like oomycete pathogen Peronospora belbahrii (P. belbahrii) (Figure 1). Figure 1. Sporangiophore and sporangia of Peronospora belbahrii. Leaves are severely affected, which can result in yield reduction or plant death. Symptoms of the disease can be mistaken by nutritional problems since they manifest as a yellowing or browning of leaves (Figure 2). However, if the abaxial side of the leaf is inspected, profuse, dark sporulation will be covering the surface of infected leaves (Figure 3). 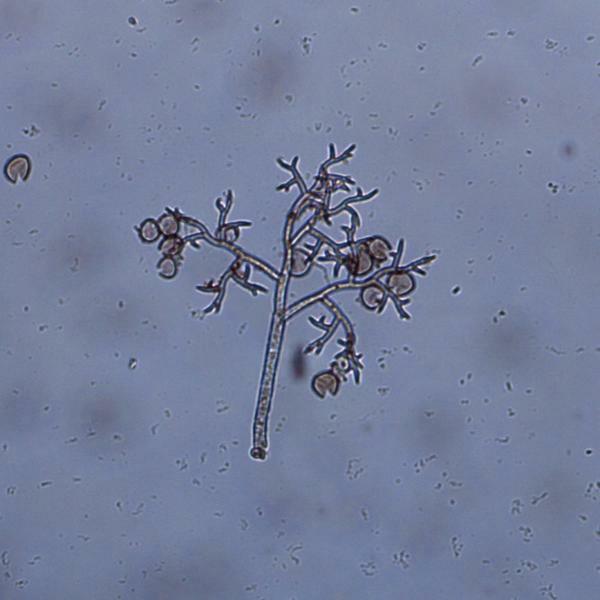 Usually, the sporulation is obvious enough that it can be seen without a microscope or hand lens, however, when you take a closer look at the sporulation on the leaf with a hand lens or dissecting microscope, you will be able to see the typical sporangiophore structures bearing sporangia found in downy mildew pathogens (Figure 4). Figure 2. 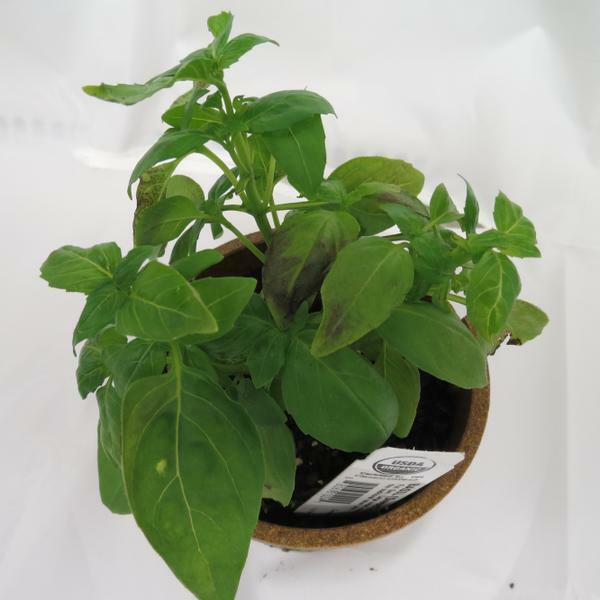 Symptoms of basil downy mildew, note browning of leaves. Figure 3. 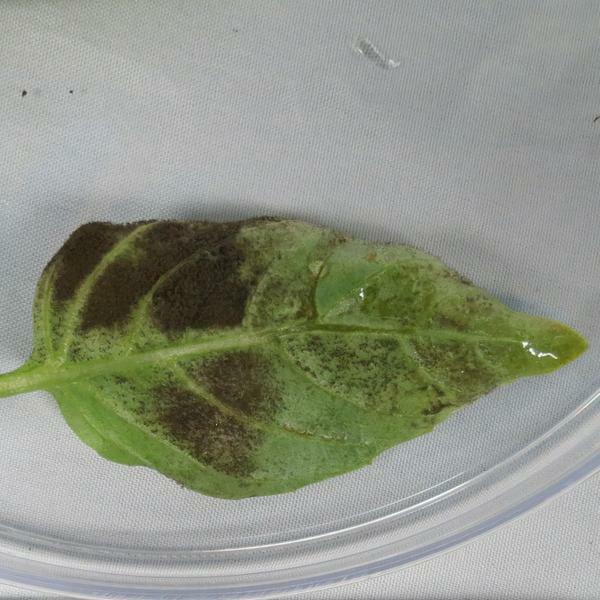 Basil downy mildew sporulating on the abaxial side of a leaf. Figure 4. Peronospora belbahrii sporangiophores bearing sporangia. High-humidity and moisture (6-12 hours of moisture are ideal and usually occur as morning dew, rain or overhead irrigation). In North Carolina, the disease typically begins in June and lasts throughout the growing season. Pathogen spores can be transported from state to state through air currents. The pathogen needs a living host to survive and it can only overwinter on plants in sites with warm weather such as the Southern United States and greenhouses. Spores come to North Carolina every year from infected plants in surrounding states or in greenhouses with year-round production. The pathogen can also be seedborne. 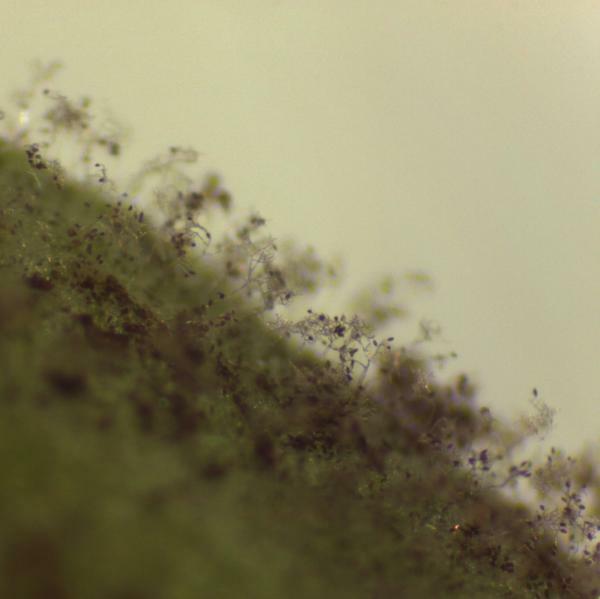 Peronospora belbahrii produces airborne spores and can also be seedborne, and like other oomycetes, such as Phytophthora and Pythium, this downy mildew pathogen thrives in humid conditions. Using pathogen-free seed is essential to prevent basil downy mildew and if the disease becomes established in your operation, consider removing infected plants to eliminate them as a source of inoculum. Reducing moisture by using drip irrigation vs. overhead irrigation, watering early in the mornings so foliage dries quickly, and allowing enough space between plants to increase air circulation will also help control this pathogen. Be diligent in checking basil leaves for downy mildew. Some varieties have been found to be less susceptible. Red basil (‘Red Leaf’ and ‘Red Rubin’), Thai basil (Queenette’), lemon basil (‘Lemon,’ ‘Lemon Mrs. Burns,’ ‘Sweet Dani Lemon Basil’), lime basil (‘Lime’), and spice basil (‘Spice,’ ‘Blue Spice,’ ‘Blue Spice Fil,’ ‘Cinnamon’), presented less severe downy mildew symptoms in a previous study. Application of fungicides is the most effective strategy to control basil downy mildew. For the latest fungicide recommendations for basil downy mildew see the Southeastern US Vegetable Crop Handbook. Fungicide labels are legal documents, always read and follow fungicide labels. Regardless of the product, it is important to apply them in a way that you achieve good coverage on both sides of the foliage, and that you apply the products before disease begins. Fungicides are most effective when applied in a preventive, weekly spray program. Organic products including Actinovate (a. i. Streptomyces lydicus), Double Nickel 55 (a. i. Bacillus amyloliquefaciens), MilStop (a. i. potassium bicarbonate), Regalia (a. i. Reynoutria sachalinensis), Trilogy (a. i. neem oil), and OxiDate (a. i. hydrogen dioxide) are labeled for basil, however, efficacy data does not show high level of control with these products. Products containing the active ingredients copper or chlorothalonil (the trade name of one product with chlorothalonil is known as ‘Daconil’) are the best and only effective products available to home gardeners. In addition, home gardeners should grow varieties with tolerance if they are worried about basil downy mildew in future years because most chemicals available to the home gardener are not sufficient to control basil downy mildew once it appears. Once plants are infected in a home garden, there is little that can be done to protect them besides weekly fungicide sprays. This factsheet was prepared by the NCSU Vegetable Pathology Lab in 2016.